The BlackLine Account Reconciliations solution enables organisations to automate and standardise the reconciliation process. It drives accuracy in the financial close by providing accountants with a streamlined method to verify the correctness and appropriateness of their balance sheets. Automating account reconciliations is a quick business win for organisations. Benefit from greater visibility into reconciliation status, timeliness, content and quality, increased control as accounting staff can ensure reconciliations are carried out correctly and audits run smoothly and greater accuracy with a streamlined method to verify your balance sheets. Quickly compare data (ERP, bank, subledger, schedules, etc.) 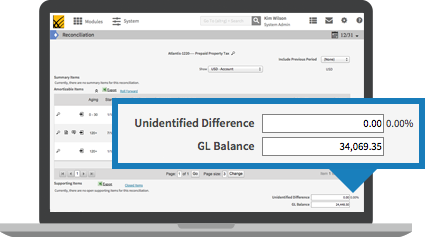 to verify the correctness and appropriateness of your balance sheets across all balance sheet accounts. Investigate discrepancies and make required corrections for an accurate close process. Attach supporting documentation and take required actions.